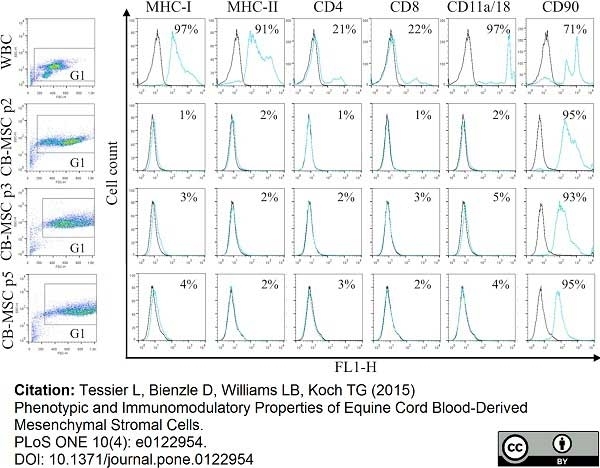 Mouse anti Horse CD44 antibody, clone CVS18 (MCA1082GA) used for evaluation of CD44 expressing white blood cells in equine samples by flow cytometry. Antigen expression on WBC in CB, and CB-MSC at passage (p) 2, 3 and 5. Consistent gates were applied for all cell analyses. 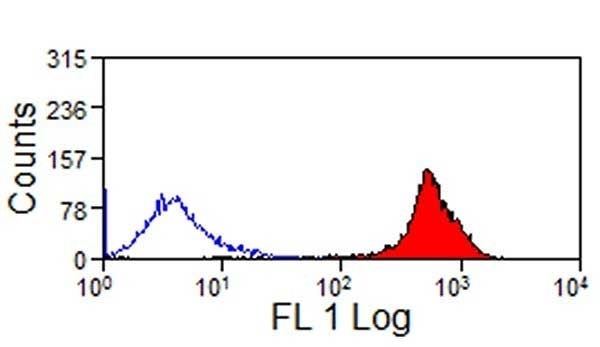 Control sample fluorescence is indicated by black lines, fluorescence of samples incubated with specific antibody by light blue/gray lines. Results were similar for samples from 5 animals. Numbers in each plot represent the mean proportion of cells expressing each antigen. Phenotypic and Immunomodulatory Properties of Equine Cord Blood-Derived Mesenchymal Stromal Cells. Mouse anti Equine CD44 antibody, clone CVS18 (AHP1082GA) used for the immunohistochemical evaluation of CD44 expression on equine endometrial sections. From: Rink BE, Amilon KR, Esteves CL, French HM, Watson E, Aurich C, Donadeu FX. 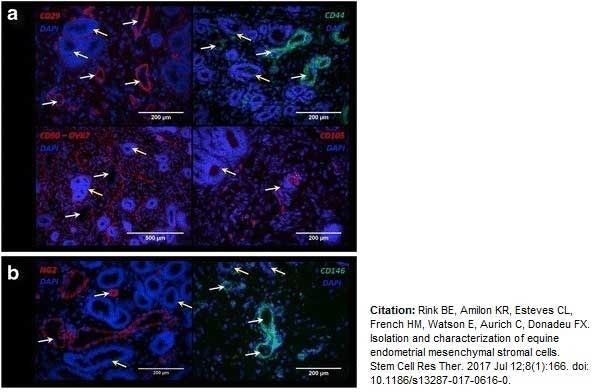 Isolation and characterization of equine endometrial mesenchymal stromal cells. Stem Cell Res Ther. 2017 Jul 12;8(1):166. 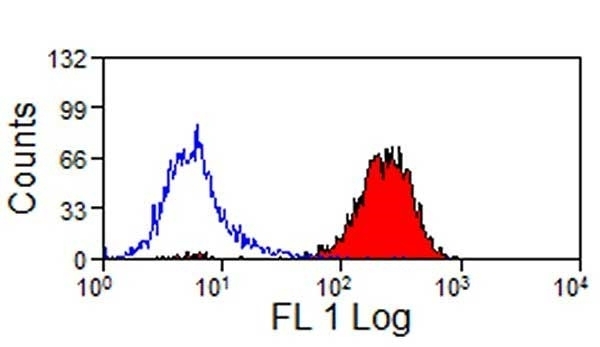 Mouse anti Equine CD44 antibody, clone CVS18 (MCA1082GA) used for the evaluation of CD44expression on equine cells by flow cytometry. 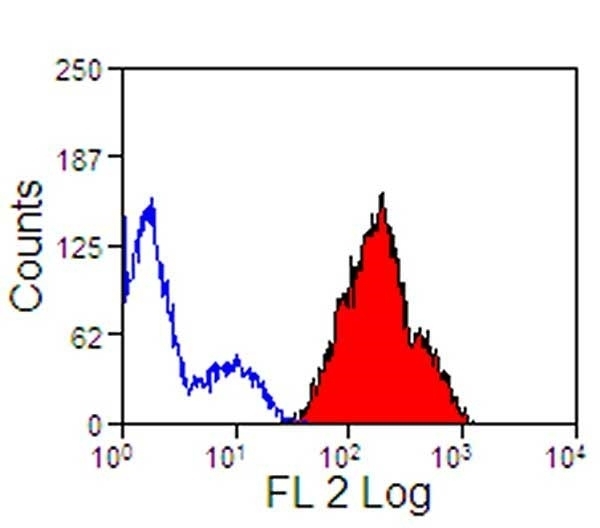 Mouse anti Horse CD11a/CD18 antibody, clone CVS18 recognizes equine CD44, a plasma membrane glycoprotein broadly expressed on the cell surface of leucocytes. CD44 is the primary receptor for hyaluronate and functions in cell adhesion. Equine CD44 is widely expressed and Mouse anti Horse CD11a/CD18 antibody, clone CVS18 may be used as a pan equine leucocyte marker. Spleen cells from immunised mice were fused with cells of the X63-Ag 8.653 mouse myeloma cell line. Kydd, J. et al. (1994) Report of the First International Workshop on Equine Leucocyte Antigens, Cambridge, UK, July 1991. Vet Immunol Immunopathol. 42 (1): 3-60. De Schauwer, C. et al. 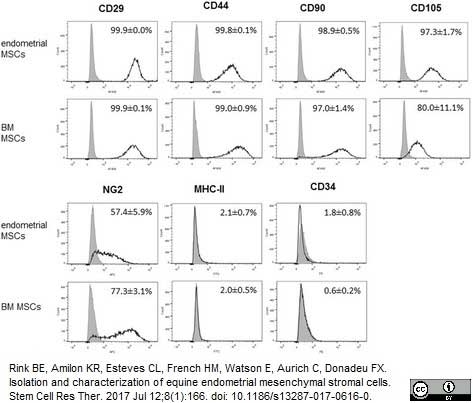 (2012) In search for cross-reactivity to immunophenotype equine mesenchymal stromal cells by multicolor flow cytometry. Radcliffe, C.H. et al. (2010) Temporal analysis of equine bone marrow aspirate during establishment of putative mesenchymal progenitor cell populations. Stem Cells Dev. 19: 269-82. Carrade, D.D. et al. (2012) Comparative Analysis of the Immunomodulatory Properties of Equine Adult-Derived Mesenchymal Stem Cells(). Maia, L. et al. (2015) Feasibility and safety of intrathecal transplantation of autologous bone marrow mesenchymal stem cells in horses. BMC Vet Res. 11 (1): 361. Maia L et al. (2013) Immunophenotypic, immunocytochemistry, ultrastructural, and cytogenetic characterization of mesenchymal stem cells from equine bone marrow. Microsc Res Tech. 76 (6): 618-24. Soboll, G. et al. (2003) Mucosal co-administration of cholera toxin and influenza virus hemagglutinin-DNA in ponies generates a local IgA response. Tessier L et al. (2015) Phenotypic and immunomodulatory properties of equine cord blood-derived mesenchymal stromal cells. PLoS One. 10 (4): e0122954. Spaas, J.H. et al. (2015) Chondrogenic Priming at Reduced Cell Density Enhances Cartilage Adhesion of Equine Allogeneic MSCs - a Loading Sensitive Phenomenon in an Organ Culture Study with 180 Explants. Cell Physiol Biochem. 37 (2): 651-665. Gomiero, C. et al. (2016) Tenogenic induction of equine mesenchymal stem cells by means of growth factors and low-level laser technology. Vet Res Commun. 40 (1): 39-48. Clark, K.C. et al. (2016) Canine and Equine Mesenchymal Stem Cells Grown in Serum Free Media Have Altered Immunophenotype. Stem Cell Rev. 12 (2): 245-56. J Eq Vet Sci. 42: 12-8. Lepage, S.I. et al. (2016) Generation, Characterization, and Multilineage Potency of Mesenchymal-Like Progenitors Derived from Equine Induced Pluripotent Stem Cells. Stem Cells Dev. 25 (1): 80-9. Maia, L. et al. (2016) Conditioned medium: A new alternative for cryopreservation of equine umbilical cord mesenchymal stem cells. Maumus, M. et al. (2016) Utility of a Mouse Model of Osteoarthritis to Demonstrate Cartilage Protection by IFNγ-Primed Equine Mesenchymal Stem Cells. Maia, L. et al. (2017) A proteomic study of mesenchymal stem cells from equine umbilical cord. Rink, B.E. et al. (2017) Isolation and characterization of equine endometrial mesenchymal stromal cells. Stem Cell Res Ther. 8 (1): 166. BMC Vet Res. 11: 63. SantosV, H.D. et al. (2019) Evaluation of alginate hydrogel encapsulated mesenchymal stem cell migration in horses. Res Vet Sci. 124: 38-45.